You cannot beat the Granary Tavern for lighting. Walk in off the Rose Kennedy Greenway and you enter a warmly glowing space, one that when it’s crowded feels mellow yet energized, full of promise. Within a minute of getting my $8 glass of merlot from the bar — a bargain, really, if it were good — a friendly young man turns to me and introduces himself as Phil. Did I mention that he is friendly? And young? Phil! Nice to meet you! I love this place. The best part is that my amused husband is standing two feet behind me and witnessing the entire exchange. The great minds behind the Granary Tavern know that you do not want your bar to be too dimly lit. You want it to be lit just dimly enough. Plenty of couples seem to have figured this out, actually. On a quiet night early in the week, the proportion of cuddly duos on dates to patrons keeping their hands to themselves at all times is surprisingly high — especially for a crowd of people who look like they just got out of work. It really is a little bit romantic. Now, Granary Tavern isn’t just a bar. It does serve food, some of it tasty, but it is not exactly a dining establishment. Sure, there are tables and banquettes and people eating and drinking in the two comfortable rooms that make up the first floor (there’s another dining room downstairs, and another bar), but it is the long bar crossing both spaces along the back wall that is its beating heart. Thanks to good staffing the wait is not too long, and the cocktails are strong and well made. Take the Angry Pumpkin, which comes in a pint glass. 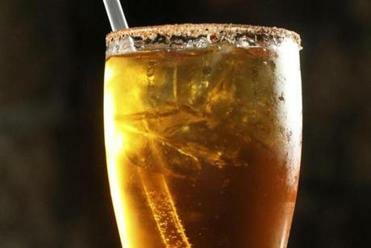 It is mostly dry cider, fortified with pumpkin liqueur, and served with cinnamon sugar on the rim. It’s really not sweet at all, honest — the cider, Angry Orchard made by Samuel Adams, is not a flowery, sugary brew, and the pumpkin just adds some richness. The Moscow Mule is gingery and made with lots of lime, and the Tavern Sling with lots of mint. And lots of gin. Sit at a tall table with friends or, if it’s a weeknight, plant yourself at the bar. Enjoy the view out of the large windows looking onto charming, quiet Central Street. It is a good place to settle in on a chilly night and chat, as I think I might have mentioned previously, with the young and very friendly clientele. You might want something from the menu, but don’t dig too deep. Slightly piquant spiced popcorn and fried chips with house-made ranch dressing for dipping are both good. 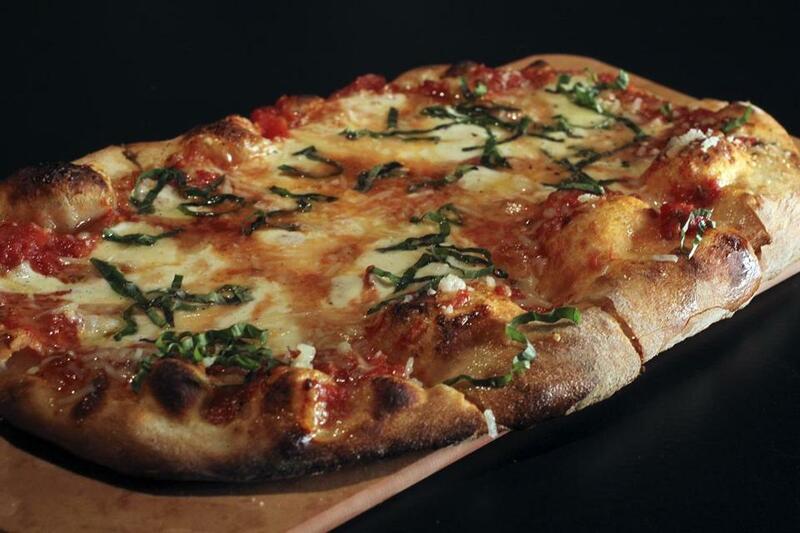 Flatbread pizzas are big enough to share; the onions on the porcini flatbread are thick and nicely caramelized and the Margherita has a lively sauce. A new chef, Keenan Langlois, started a couple of weeks ago and has changed a few menu items. The old clam chowder was very good. It was modern — light with a flavorful broth, and not too buttery or creamy — and full of clams and celery. Langlois’s version loses the celery and adds cream and Old Bay-spiked butter. The Granary Burger, which is juicy, big, and dominated by the smoky bacon and runny fried egg that come on top, arrives with serviceable french fries and a slightly spicy, tangily sweet dipping sauce made from sriracha, ketchup, mayo, Worcestershire sauce, and lemon juice. The brioche bun is perfect. That same brioche holds the blackened catfish sandwich together as the flaky fish tries to slide away, awash in sweet barbecue sauce. House-made bread-and-butter pickles on the side of the sandwiches are just OK, not made with quite enough spice to really flavor the vinegary cucumbers. And on one recent visit the promising-sounding cheese and Harpoon beer fondue had separated into an oily stew with gloppy blobs of fontina at the bottom of the dish. Some of the fried menu items are good, too: The chicken and waffles is crispy and just the right blend of savory and sweet, the oysters in the po’ boy come with a thick, crunchy breading and are served in a soft top-loader. Dishes from the fryer, including flat-tasting chicken fingers and fish and chips — is there a salt shortage in this neighborhood? — arrive at the table piping hot and are as a result not bad. Beet salad with arugula and goat cheese has too many beets and not enough of anything else, especially salt. The mixed Granary Salad is better balanced, with a mix of greens plus feta, tasty carrots, and slender green beans. The lack of seasoning only becomes truly disappointing in the main dishes — beautifully seared scallops and pork loin that is juicy and thick both show up bland and tepid, even at a table located just steps from the kitchen. Langlois did switch the sauce on the old scallops, which was made with Vermouth and seemed too classically French for this place, and he added a cider glaze to the pork, now a pair of chops. He also switched the greens that were served with the scallops to the pork dish, a good move. Ordering dessert can go either way. One night the apple pie was served hot, its crust flaky and filling tasty. We didn’t leave a bit in the bowl. Another time it came splayed out on a plate and drizzled with sweet caramel sauce — too much of too many good things. We tried a few bites and gave up. On nights when upstairs is too busy or too loud, you may be tempted to slip down to an empty table or even a seat at the bar on the lower level. Please consider yourself warned. You do not want to go into the basement of the Granary Tavern. Yes, the beams in the ceiling, some of them 12 and even 16 inches thick, hint at the neighborhood’s long history and strong backbone. But the cooking happens downstairs and cooking is a messy business, and you don’t need to look into the kitchen window at the floor nobody has bothered to clean even though it is 7 p.m. on an admittedly busy Tuesday. If you must go down, take the back stairs, as the front ones have a clear view of that kitchen floor. It’s like watching a bad cooking show. Except for the salt. Devra First is on leave. Restaurants in Dining Out are reviewed by a rotating team of Globe staffers. Anne V. Nelson can be reached at anelson@globe.com.